PHP Introduction: What is PHP ? 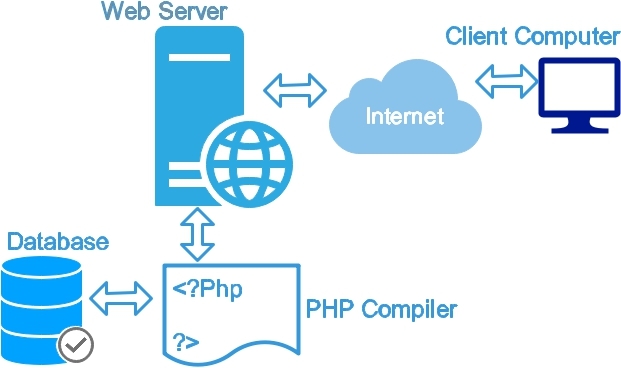 PHP is a server side scripting language, widely used in internet programming. We can develop pages with dynamic content by using PHP. By using PHP we can interact with database servers and manage the page content accordingly. PHP runs at Web server side. Your web browser at client end can’t execute PHP code. PHP script handles database and manages records at server end. What we can do by using Php? Create member signup , login pages and store the details as records in a database. Manage content of a website. Create dynamic graphs and images, draw charts. Let us take one simple example. The file extensions for PHP pages. Web sites are organized at the server like we organize files and folders. So when we open a website one of the default file opens as home page of the site. Read here on how to fix the default page of a website . Usually files with php or php3 ( in old version of PHP ) extensions are files which contain PHP code. Same way we can say the files with .asp are the active server page files contains asp code. But this is not always true. At the server settings we can change the settings and tell the web server which type of files to execute through which engine or scripting language. A file with .htm extension can pass through php engine to execute php codes present inside. Read how IIS is set to pass different extensions through different engines. However after executing different types engines the final script is posted to user browser which does not contain any PHP, ASP or any other types of scripting language and it only contains HTML and other client side scripts. By using PHP can we manage the layout of a web page ? Without installing PHP at the server can we execute a php file with php code inside ? Does the file extension matter ( by default without changing the settings ) at server end for executing scripts. i want the complete tutorial of PHP. Would like to learn php,so i want the full tutorial and how to configure it. i want some sample project with clear coding in only php. I want complete PHP scripts. want some sample project with clear coding in only php. how do I set up the server to accept php uploaded files?